In which bruiser should I invest in? In which of these guys should I invest my tokens? 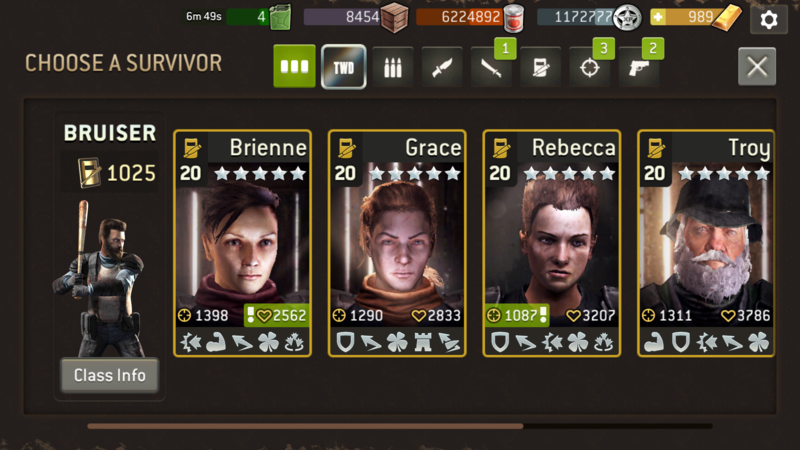 I won't promote any Melee survivor without Strong. IMO Troy's traits are 10/10 for any melee survivor, with Brienne being a 9/10. Power strike is quite effective in certain situations, but iron skin works always. True. But having gold iron skin on the armor and iron skin on the survivor will make him take a good amount of hits. It would also all depend on what you would want your bruiser for. Normally they don't do a lot of damage and don't actually need to since they can stun. Sometimes a bit extra damage is good, for example, if you need a final hit to finish off a fatty. But most of the time you want to stun and be able to resist a lot of damage. Rebecca and Troy are definitely awesome bruisers! Rebecca would be good if you'd use her as a shield. I would like her better if she had defensive stance (for shield purposes, overwatch + defensive stance, dodge, retaliate and iron skin plus luck is a good combo... or bullet dodge instead of luck if you also raid or go against Freemen). "Well, none of your bruisers is bad,... "
Thx guys for all of your thoughts and hints!